The fourth annual Casserole Olympics were held yesterday, Saturday, April 23rd. As usual, the Olympians’ casserole entries were spectacular. The competition was fierce. And the winners were richly deserving. Silver medalist Steve Auerbach, who has his second Casserole Olympics medal, after winning the gold medal in the first annual Olympics. 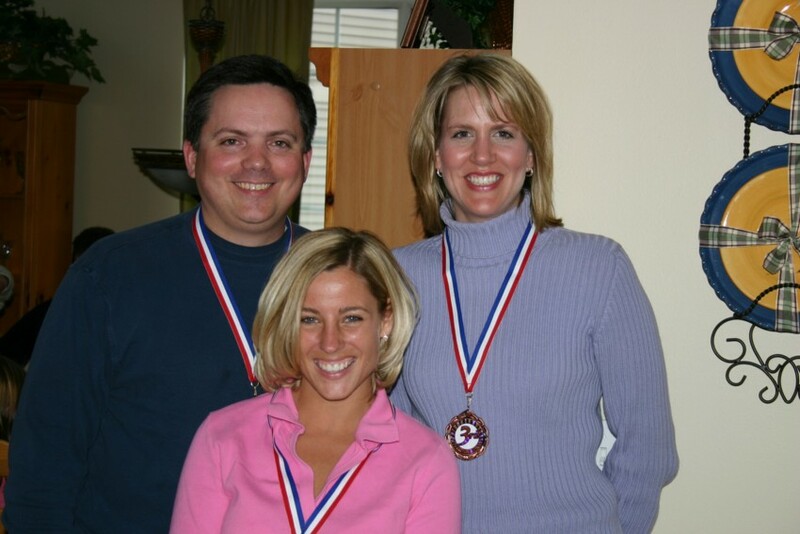 Gold medal winner Carrie Norteman now has a gold medal to go with previous silver and bronze medals – she is the only three-time medalist at the Casserole Olymics. Bronze medalist Dana Kapadia, who won this medal in her first ever Casserole Olympics. The best part was that this year, we were able to deliver 10 pans of casseroles to Hesed House, a local shelter for the homeless here in Aurora. We used the Casserole Olympics to close the chapter on John’s Saint Baldricks Day fundraiser.We’d like to warmly thank all those who participated, either by making a donation, or by helping to promote it. (In some cases, both donating and promoting!) Yes, John is, at the moment, utterlyand completely bald. It is worth it. Please accept our heartfelt thanks to everyone who helped.